Jeffrey J. Brown & "Khebab"
Fifty years ago this week, on March 8, 1956, at a meeting of the American Petroleum Institute in San Antonio, Texas, M. King Hubbert, in the preprinted version of his prepared remarks, had the following statement, "According to the best currently available information, the production of petroleum and natural gas on a world scale will probably pass its climax within the order of a half century (i.e., by 2006), while for both the United States and for Texas, the peaks of production may be expected to occur with the next 10 or 15 years (i.e., 1966 to 1971)." As more and more people are learning, Lower 48 oil production, as predicted by Dr. Hubbert, peaked in 1970, and it has fallen fairly steadily since 1970. Kenneth Deffeyes, in Chapter Three of his recent book, "Beyond Oil: The View From Hubbert's Peak," described a simplified way of predicting the production peaks for various regions and for their subsequent declines. One simply plots annual production (P) divided by cumulative production to date (Q) on the vertical axis, or P/Q, versus Q on the horizontal axis (see Figure 1). 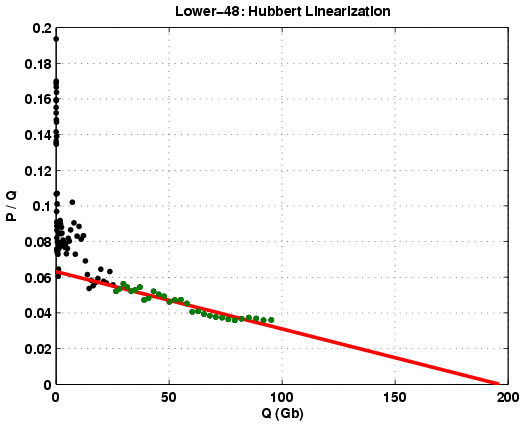 Stuart Staniford, on The Oil Drum Blog, has described this technique as "Hubbert Linearization" or HL . 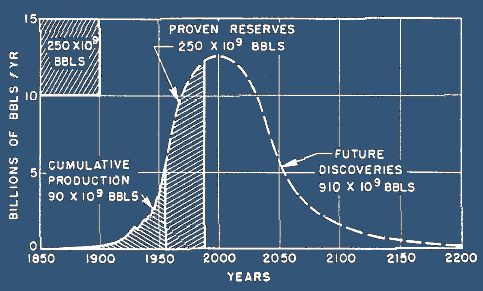 This suggests that we can almost certainly place a good deal of confidence in Dr. Deffeyes' prediction that the world is on the edge of a permanent and irreversible decline in conventional oil production. If the Lower 48 were the sole source of crude oil for the world, for every two gallons of gasoline that the world bought in 1970, we would be bidding for one gallon today. 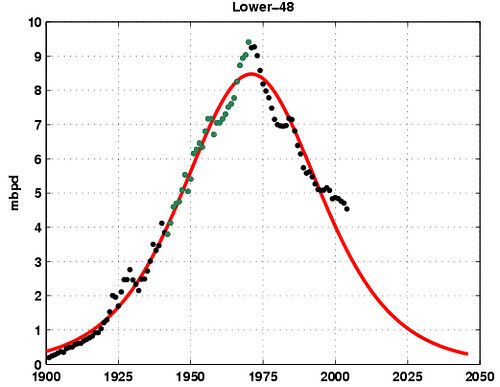 The predicted Russian production profile is the most controversial of the four plots that we analyzed. However, Russian Minister of Industry and Energy Viktor Khristenko, in an interview with Russian Profile , had the following statement, "One important point is that the longer we delay making this decision (encouraging frontier exploration in Russia with tax breaks), the harder it will be to feel the effectiveness of the measures taken: the structure of the country's reserves will continue to get worse and Russia could end up facing a real collapse in oil production." A critical point to keep in mind is that an exporter can only export what is left after domestic consumption is satisfied. 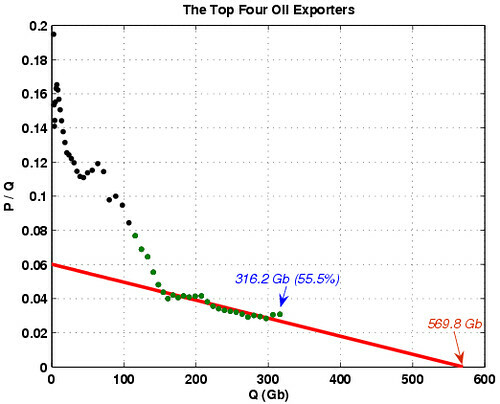 Consider a simple example, a country producing 2.0 mbpd, consuming 1.0 mbpd and therefore exporting 1.0 mbpd. Let's assume a 25% drop in production over a six year period (which we have seen in the North Sea, which by the way peaked at 52% of Qt) and let's assume a 10% increase in domestic consumption. Production would be 1.5 mbpd. Consumption would be 1.1 mbpd. Net exports would be production (1.5 mbpd) less consumption (1.1 mbpd) = 0.4 mbpd. Therefore, because of a 25% drop in production and because of a 10% increase in domestic consumption, net oil exports from our hypothetical net exporter dropped by 60%, from 1.0 mbpd to 0.4 mbpd, over a six year period. As the reality of declining conventional oil production sets in, enormous amounts of capital and energy will be allocated toward nonconventional oil reserves in an effort to try to keep the supply of liquid transportation fuels--gasoline; diesel and jet fuel--growing. The principal effort will be focused on very heavy oil, bitumen (tar sands) and coal liquefaction. These nonconventional sources will help, but the key point to keep in mind is that we are merely discussing increasing the rate of extraction of fossil fuels. The question we have to ask is whether the enormous amounts of capital and energy might be better spent on renewable energy projects. 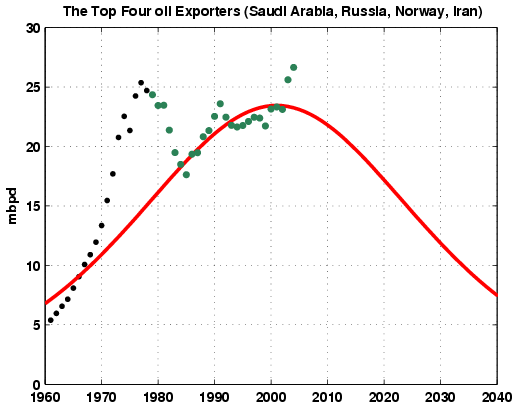 In any case, we predict that nonconventional sources of oil will only serve to slow--and not reverse--the long term decline in world oil production.